Miroslav Hadžić is a President of the Executive Board of the BCSP and one of its co-founders. During 1972-1973 he worked as a Research Associate at the Army Centre for Andragogical, Psychological and Sociological Research in Belgrade. 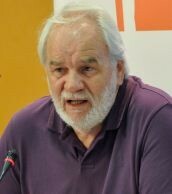 He has spent most of his career as a lecturer at the Higher Military Political School of Yugoslav Armed Forces (1972-1994). From 1992 to 1994 he was an Associate Professor of Military Sociology at the Military Academy in Belgrade. In January 1994 he requested to be discharged from the Yugoslav Army Forces and refused to wait for retirement. During the next five years he worked in the Department for Sociological Research at the Institute of Social Sciences in Belgrade. Since 2002, he has been a professor at the Faculty of Political Science in Belgrade. His major academic interest is SSR (especially military reform). Mr Hadžić is the author and editor of numerous books and articles out of which most famous are: Yearbook of security sector reform in Serbia published in 2009, The Yugoslav People’s agony: the role of the Yugoslav People’s Army published by Ashgate in 2002, The chronic lack of security: the case study of Yugoslavia published in 2001. He is a member of European Research Group on Military and Society, the Advisory Board of the Geneva Centre for Democratic Control of the Armed Forces (DCAF), Serbian Political Science Association, and Forum for International Relations.